On the morning of June 12, my heart was ripped out of my chest. It was the Friday that, as a teacher in Makor Chaim (“Source of Life”) yeshiva high school, I received a text message that two of our students had been kidnapped. Later we heard that there was a third boy, from Yeshivat Shavei Hevron. Friday afternoon we received an SMS asking that any of us who live in a community that includes students from Makor Chaim, meet with those students on Shabbat afternoon. We were sent a chart listing the names of the synagogues and the time. It’s a dorm school and they had come home for Shabbat. We let them talk. 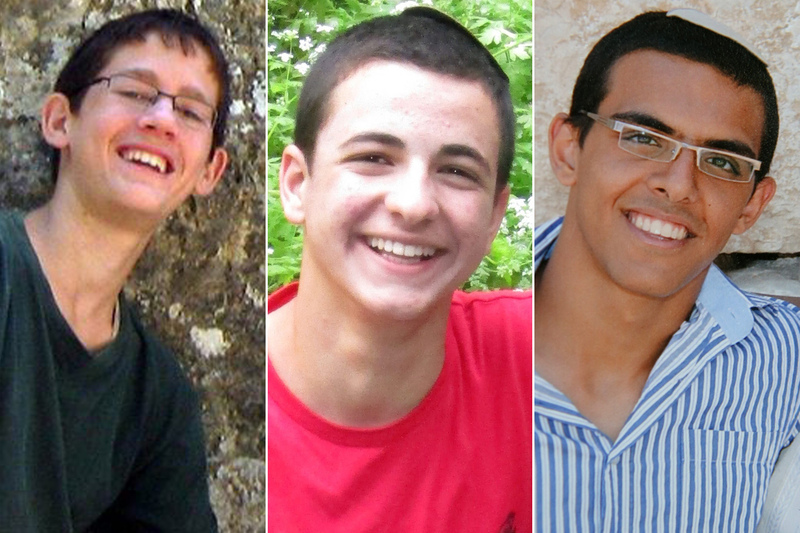 Several of the boys who came were in the same class with Naftali and Gilad. They spoke about how they had heard what happened and what they knew so far. We added our own words of faith and encouragement and finished with the reciting of Psalms. The boys in Makor Chaim come from all over, so similar meetings took place throughout Israel. I never forget a face but I’m challenged when it comes to remembering the names of all of my former students, so as we left the synagogue, I asked one of the other teachers to describe the boys who were kidnapped. “You know Naftali,” she said. “He was your student two years ago. Tall, lanky, quiet.” Tall and lanky was irrelevant because he was neither when I taught him at fourteen, but the “quiet” jogged my memory, as that had been a class filled with some of the brightest and funniest boys I’ve ever taught. They would sometimes call out a certain phrase that they knew threw me into a fit of laughter. When that happened, Naftali would just sit there, with a wry smile I had grown to love, doing his work calmly. On the Saturday night and Sunday following the kidnapping there were emergency staff meetings with rabbis, education ministry officials, social workers and trauma experts. In the days that followed there were prayer events, visits to the yeshiva from the newly elected president of Israel and the chief rabbis. This rustic yeshiva, consisting of caravans in the heart of Kibbutz Kfar Etzion – where I “discipline” a student by telling him to take a ten-minute meditation walk in nature (within the kibbutz security fence) — was suddenly at the eye of the storm, the focus of attention from all over the world. Teachers were asked, at the time, to not give interviews to the media, and we honored that request. As the days following the kidnapping slipped seamlessly, sleeplessly, one into the next, and the country united in its anxiety and prayer, as never before, so grew the apprehension that the end might not be a good one. The night I got the text message from my daughter that an announcement had been made on TV that they found the bodies, I was in the audience of our local community center, watching an amateur production of Prince of Egypt. I slipped out of the hall, and in the lobby saw the mayor of our small town hunched, with others, around a smartphone, imbibing the tragic details. The next day my husband and I were among the tens of thousands who attended the funerals. We went to Naftali’s and, while waiting for it to begin, we sat in silence among other teachers and students from Makor Chaim. There was nothing to say, just bottles of water to pass in the heat, and silent thoughts. Of all the heart-wrenching and eloquent words we heard that day, one line stands out in my memory. It was when Racheli Frenkel said she was grateful for the chesed — the kindness — that the boys had been found, “and that is no small thing.” I understood what she meant because in 2009 I had interviewed Miriam Baumel, the mother of Zecharia Baumel. Zecharia and five other soldiers were missing during the war “Peace for Galilee” in 1982, after the chaotic battle in the village of Sultan Yakoub, marked by a Syrian ambush of the Israeli forces. Soldiers Hezi Shai and Arye Lieberman were returned in controversial prisoner exchanges several years later; Yehuda Katz and Zvi Feldman, like Zecharia, like pilot Ron Arad, have not been heard of since then. Horrific as the death of the three teens was, it would have been so much more terrible for them to have remained missing forever, their fates unknown. Nevertheless, for a mother to call the finding of their bodies a “chesed” was a level of acceptance and greatness I found astounding, unfathomable. Hamas operatives were routed and arrested – even before the finding of the teens’ bodies – by the scores. And then the ground exploded beneath our feet as rockets exploded in the heavens above, as our soldiers went into battle to keep our people safe. Israel is a small country. Everybody knows somebody who died in the war, and we’re no different. The cousin of our new son-in-law. The son of our daughters’ high school literature teacher. The grandson of a neighbor in Efrat. The fiance of a young woman whose mother was the librarian in Gush Katif. No Jew here is an island. As our grandchildren in Ofakim, down south, huddled in their safe room, the family of another daughter, in Shomria (north-east Negev), almost escaped the sirens, but once. She was napping so soundly when the siren went off that her seven-year-old son had to wake her up. They ran to crouch down in a hallway, away from windows, as there is no safe room in the pre-fab house in which they dwell, to where the residents of Atzmona, Gush Katif, were sent after the Disengagement. Her other children were out of the house. Her oldest daughter – 14 – was with the three-month-old baby at the local library – also without a safe room – so she took the baby and joined the others in a corner of the room with no windows. Another daughter had taken her younger siblings to a “gymboree,” thankfully located in one of the few bomb shelters in Shomria. On the personal front, I sank into the darkest writer’s block I have ever known, a deep black cave, at a total loss for how to capture grief in words. At the beginning of September, I returned to the rustic caravans of Makor Chaim, to the dusty pathways packed hard beneath my sandals, the trees moaning in the autumn wind and the slightly creaky caravan doors. It was still warm and the air conditioner, far across the room from my desk, wasn’t quite doing its job. But I looked into the faces of a new crop of 9th graders, who come from the south and the north of Israel, from Jerusalem and from kibbutzim, from settlements and small towns. I saw faces filled with curiosity and expectation. What messages or wisdom will I bring them today? Before I entered the class, I met a colleague and asked her, “How are the older boys doing?” “They’re trying to move on,” she says. In addition to Naftali and Gilad, Major Benaya Sarel, a graduate of the yeshiva, was one of the last soldiers to die in Operation Protective Edge. In an ironic and prescient twist, my students at another local yeshiva high school — Neve Shmuel — had entered a film in a Ministry of Education contest last May; the assigned topic was “The Other is Me.” Their film, a James Bond parody, was about a man who was kidnapped and then rescued by four agents, with diverse personalities and backgrounds, who had to learn to get along in order to accomplish their mission. They succeeded, but lost an agent in the process. These are just a few of the messages that permeate our children’s lives: that sometimes good men die and that we need to hang together. On my first day back at Makor Chaim I spread out photographs on the floor and had each student choose one and talk about how it connected with his summer. More than half the students had fathers or brothers or cousins who had fought in Operation Protective Edge. The boys talked about the holy and the mundane – hiking and summer jobs, snappling and campfires, prayer and the study of Torah, sorrow and unity. I gave them a homework assignment – to write short poems or one-line stories based on the idea that emerged from the exercise. One of them came up to me at the end of class and said, “I’m done.” “Already?” I asked. He handed me a piece of paper with one line, transliterated from the Hebrew – “Am Yisrael Chai.” The people of Israel live. On that day, though my heart was still shattered, my writer’s block broke. I am sometimes asked why I teach. I feel that I have been handed a gift, for I know that the belief and courage of these young men will one day move the foundations of the world. When she isn’t teaching, the author is an award-winning theater director and editor-in-chief of WholeFamily.com.